Mighty battles in an age of unending war. After the End Times, after the cataclysmic shattering of the Old World, after drifting through the universe clinging to what little remained of that broken planet, what then for Sigmar? The formation of the eight interconnected Mortal Realms, whose location and secrets were taught to Sigmar by the great drake Dracothion, and the Age of Myth. Lifetimes passed, civilisations rose, and gods walked the lands as men. But this time of prosperity could not last forever. Strife, struggle and open war broke out - and the Dark Gods saw their opportunity. The Realm of Chaos spewed forth countless daemon legions, overwhelming and crushing their opposition, and the Age of Chaos began in earnest. Sigmar’s great warriors, the Stormcast Eternals, have faced their trials and emerged as gods. Bequeathed with a portion of the power of Sigmar himself, each is a potent force, descending from the skies on wings of heavenly light to annihilate and cleanse the corrupted forces of Chaos. The Age of Sigmar has begun. Continue the story of Sigmar’s strike against Chaos with this fantastic hardback book! Inside, you’ll find a huge selection of Battleplans - these are new ways to play Warhammer Age of Sigmar, scenarios that complement and add to the core ruleset to give you new and unique command abilities for your generals, differing victory conditions, objectives and goals for your armies to clash over and set-up/battlefield environment rules special to the story you’re recreating. The Age of Sigmar is a fraught and dangerous place, and the tales from the Realms are endless and exciting - this book throws you headfirst into the spectacular war of the Stormhosts, and adds depth, detail and insight into the struggles Sigmar and his alliances face. 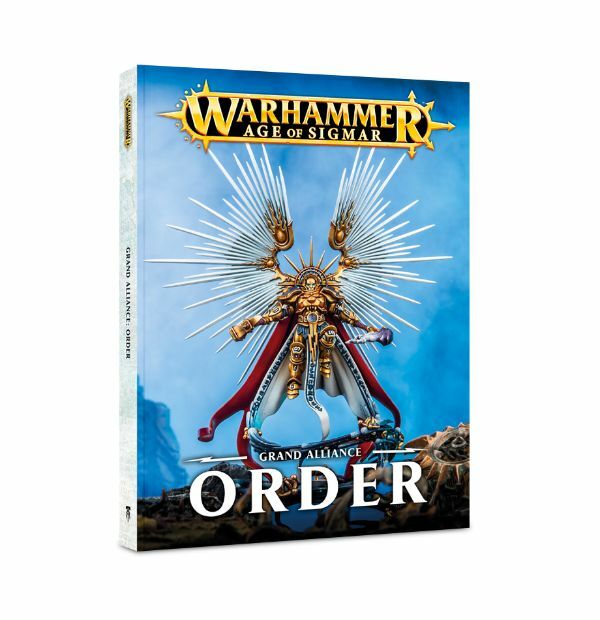 Included are Warscrolls for the following featured forces - Stormcast Eternals, Khorne Bloodbound and Sylvaneth, and Warscroll Battalions which provide special abilities and conditions for groups of warriors. This full-colour, hardback 264-page book also contains a treasure trove of stories from the Realms, incredible new artwork, gloriously photographed miniatures, colour schemes and heraldries - it’s a true must-have purchase for those who want to get the most out of their copy of Warhammer Age of Sigmar! #GAW 82-02-60-NEW - Price: $ 74.00 - $ 59.20 On Sale! A truly weighty tome clocking in at over 300 pages, Grand Alliance: Chaos is an absolute must-own artifact for anyone and everyone collecting Warhammer Age of Sigmar Chaos armies; whether concentrating on a single faction, mixing and matching from the range or splitting the pantheon into smaller chunks, this book is everything you need! The ultimate guide to the myriad forces of Chaos it features extensive information on each of the 21 the factions that make up Chaos, Warscrolls for each and every warrior and beast from each faction (a total of 158! ), guiding information and diagrams helping you to choose, collect and organise your forces into armies ready for the gaming table - and a number of Warscroll Battalions, collections of Chaos might with their own special rules and abilities. Put simply, if you love Chaos, you’ll REALLY love this softback book. #GAW 80-13-60 - Price: $ 33.00 - $ 26.40 On Sale! Let loose the beasts of war! The followers of the Great Green God, Gorkamorka, spill onto the Mortal Realms in a motley patchwork of clans, mobs and thuggish gangs all intent on absolute destruction. Drunken Aleguzzler gargants stagger into the fray, malodorous troggoths and grots swarm over unfortunate foes, enormous greenskinz and Ironjawz kick in the teef of anyone nearby (up to and including each other, more often than not…) This Grand Alliance is a riotous, joyous blur of shouting and violence from which not even the landscape is safe! 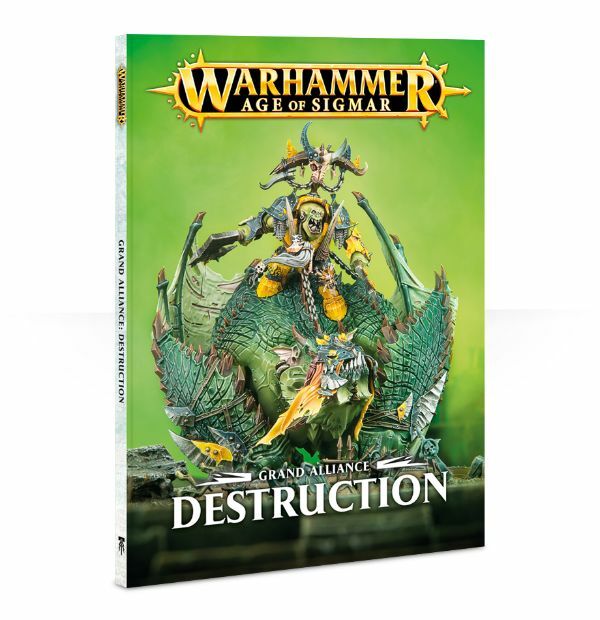 This 104-page book is the indispensable guide to the armies and factions of Destruction at the dawn of the Age of Sigmar. A must-own for all collectors and players of this Grand Alliance, and indeed anyone collecting and playing Warhammer Age of Sigmar, it takes you through the forces of Destruction with Warscrolls for every miniature, extensive information on the twelve factions, and sample armies to help you mix and match your collection into a fearsome fighting force - or provide inspiration for your next steps into the world of Warhammer Age of Sigmar. #GAW 80-11-60 - Price: $ 16.50 - $ 13.20 On Sale! 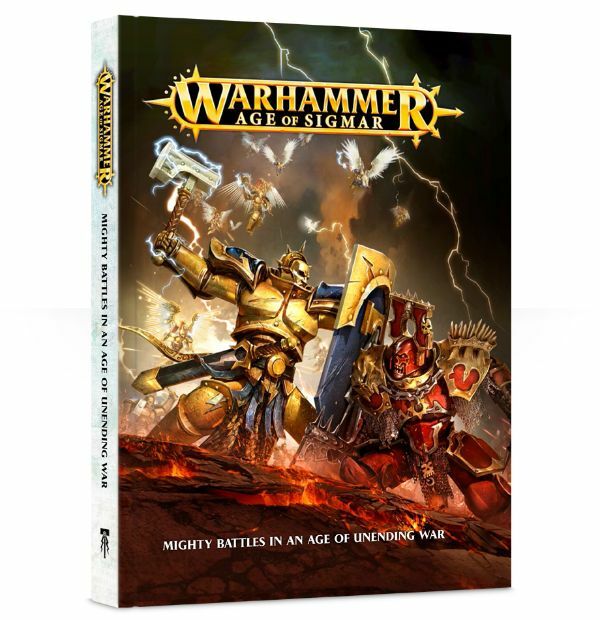 Revised and updated with new ways to play and gaming tweaks based on feedback from the Warhammer community, this is the best way to get bang-up-to-date with Warhammer Age of Sigmar, however you like to play. 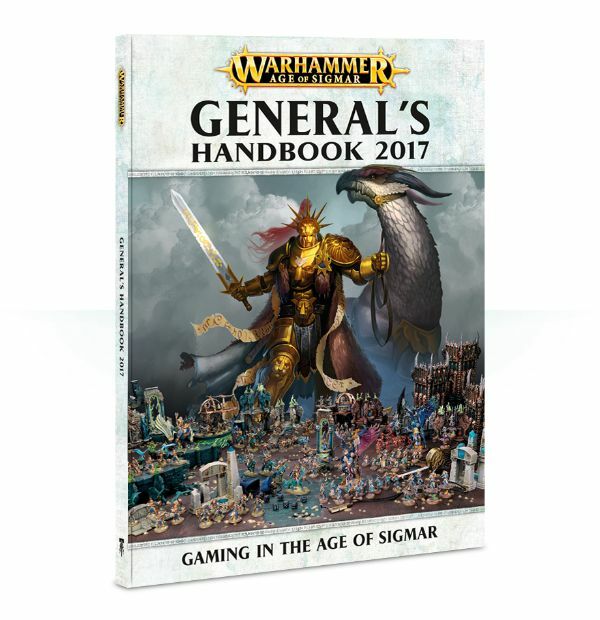 An essential toolkit of rules that you and your gaming group can use in any way you like, the General’s Handbook 2017 expands upon the rules of Warhammer Age of Sigmar – and those found in the previous iteration of the General’s Handbook – in a 158-page softback book. The stories from the Mortal Realms are an important part of Warhammer Age of Sigmar – your collection of miniatures is made even more special by the rich history and thrilling tales told about them in various publications, making the hobby of collecting them an even more exciting venture. Narrative Play gives you a way to recreate the epic battles that have taken place in the Mortal Realms. The General’s Handbook shows you how to theme an army for Narrative Play, contains advice on where to find the inspirational stories that fuel the games – and how to build your own stories and play exciting games within them. This section of the book contains Time of War rules for playing Narrative battles in each of the Mortal Realms, with wildly differing play styles appropriate to their environments, with 6 battleplans. It also includes Siege Warfare – detailed rules for battles in which one player must assault the other’s stronghold, which introduces the Siege Phase. In this, the attacker can smash against the stronghold, tunnel beneath it or simply starve out their foe, who can gather supplies and counter-attack in turn; 2 battleplans for this are included. Balanced armies of course mean that there will be gamers itching to prove themselves in tournaments, and the Pitched Battle rules are expressly designed to get armies matched up and onto the table with a minimum of fuss. Does your gaming group have the whole night to play, or is time of the essence? This book has suggestions and recommendations for various sizes of gameplay an epic battle that takes a whole night, skirmish for an hour, or anything in between. Also included are rules for Ladder Campaigns – the General’s Handbook will make setting up and maintaining tournaments easy. An exhaustive list of Allegiance Abilities for Order, Chaos, Death and Destruction armies, along with a further 15 Allegiances – Fyreslayers, Seraphon, Darkling Covens, Wanderers, Slaanesh, Skaven Pestilens, Skaven Skryre, Slaves To Darkness, Brayherd, Flesh-Eater Courts, Nighthaunt, Soulblight, Ironjawz, Free Peoples and Dispossessed. With this book’s updated rules, it’s now possible to take 400 points of an Allied army without affecting your main force’s Allegiance Abilities – themed armies based on your collection are possible! Pitched Battle profiles for each Warscroll and Warscroll Battalion from Battletomes and Grand Alliance books available in the range at time of printing, updated following feedback from the Warhammer community – these are designed to overwrite any published prior to August 2017. #GAW 80-14 - Price: $ 35.00 - $ 28.00 On Sale!